March | 2011 | Another Beautiful Day in Paradise! We had a very busy day in Paris. It’s too bad so much of it was spent “enjoying” the delights of the Parisian mass transit system. 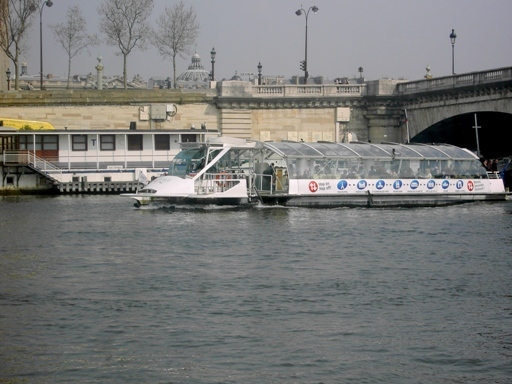 A total of three trips between central Paris and the airport, amounted to about four hours of transit time. Either my alarm clock didn’t work or I didn’t hear it (a real possibility), but I didn’t awake until Ron called me a little after 7:30 am. That gave us a late start and we never caught up. However, we didn’t really worry about it and made the most of the time we had. Ron, Birdie and I ran out for a breakfast of pastry and coffee and orange juice at a sandwich shop around the corner. 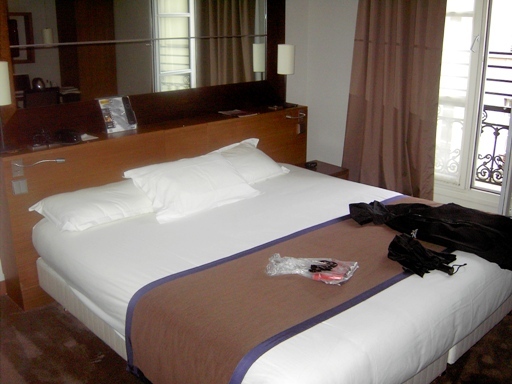 Then we got our bags and reversed our steps from Tuesday morning and headed out the Best Western Hotel near the airport. Our three days of experience we picked up maneuvering through the Metro and train system made the trip back to the airport a little easier than the trip in on Tuesday, but not by much. We had two Metro (subway) trains and the longer RER above-ground train. All were jammed packed. It was tough to get our bodies onto the trains, let alone our luggage. The combination of luggage and crowds made the process like running an obstacle course in a rat maze. As we went to board our second Metro train, Ron asked me to confirm our destination. 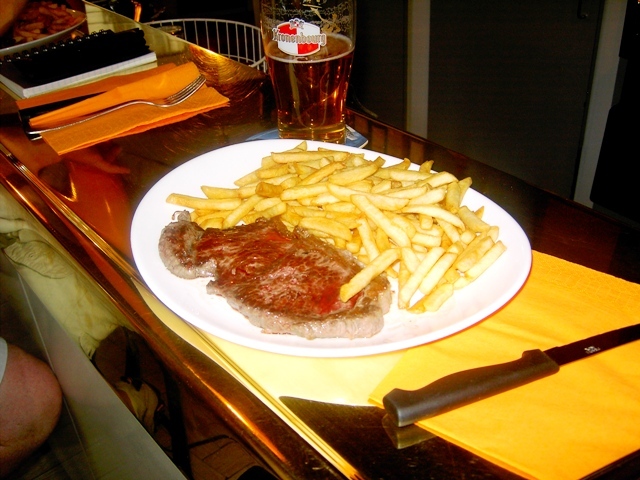 “Chatelet des Halles,” I told him. It was good he asked, because while I made it on the train, Ron and Birdie did not. There just wasn’t room at the door they tried to use. What they did see, as the train pulled away, was me falling backwards. Because it was so cheek-to-jowl crowded, I thought it would be best for me to remove my backpack to reduce the space I was taking. As I pulled the backpack off, the train took off. I just felt myself falling backwards – right into the lap of a teenaged girl. Since the train was still accelerating and there was nothing for me to grab on to, it took me maybe 10 seconds or so to be able to extract myself. 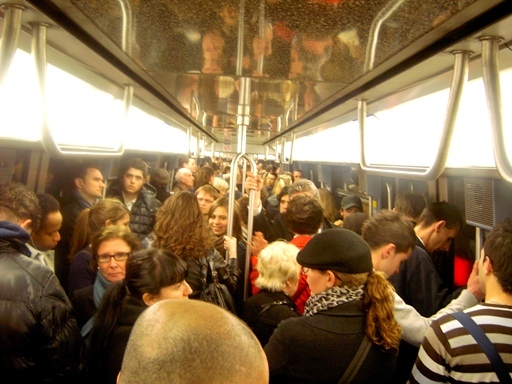 Very embarrassing, but right in line with many of our other adventures on the Paris Metro. We finally made it out to the Best Western around 1130 am and connected with my brother, Dan, and the rest of the tour group. 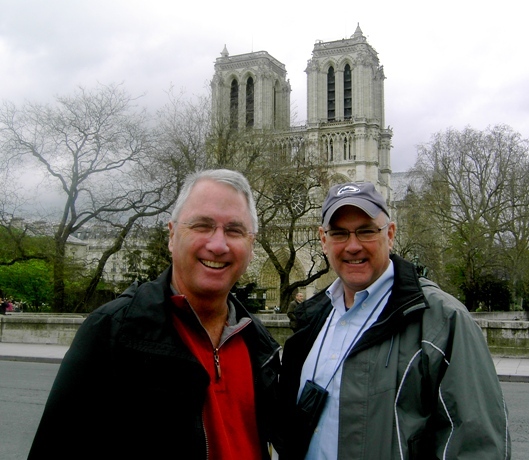 After dropping off our bags and getting situated, we headed back into town for lunch and a visit to Notre Dame. 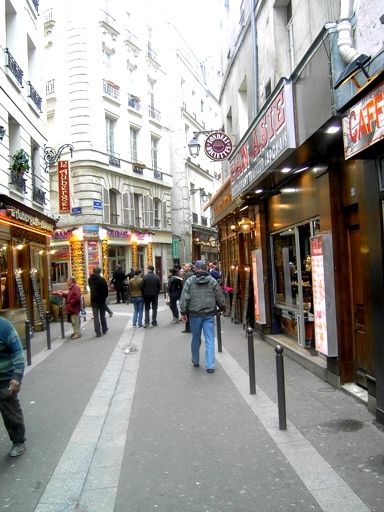 We did a short walk through the Latin Quarter south of Notre Dame and ate a very nice lunch at a little sidewalk café. None of us could make sense of the bill, but we decided that it was a good meal at a reasonable price, so we just paid it and left a tip. 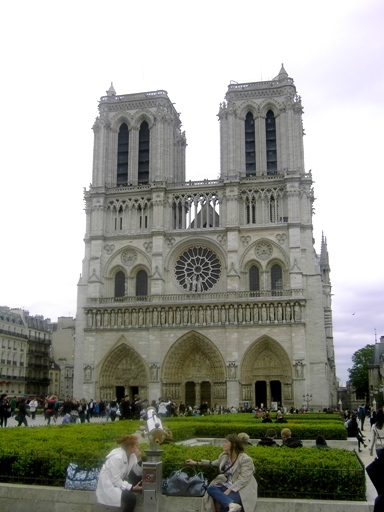 We toured the Cathedral of Notre Dame, which was just amazing. Here is a sample of some of my photos. 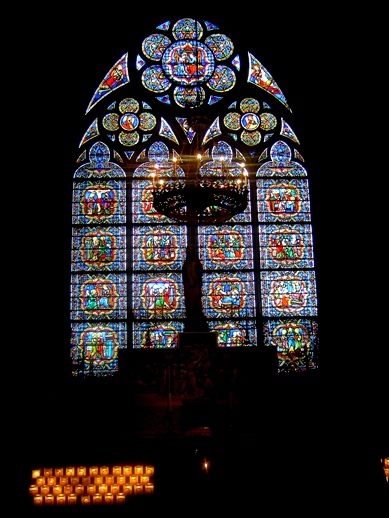 One of the many stained glass panels. 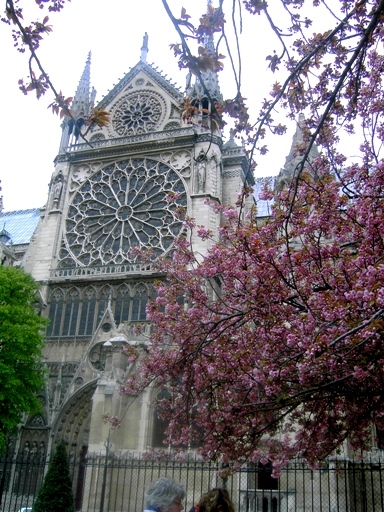 The right transept with cherry blossoms. 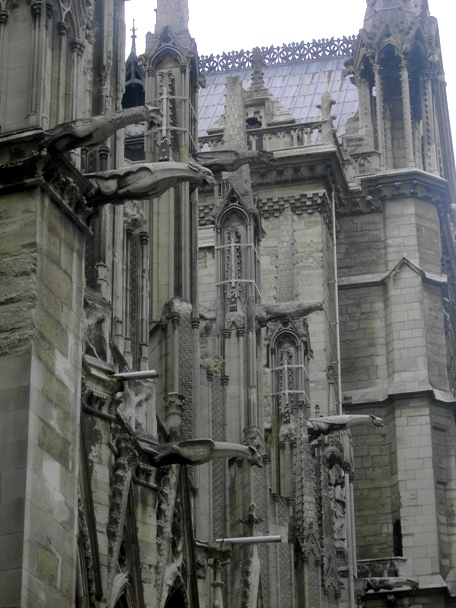 The flying buttresses that hold the walls up. It seemed like our trip back to the Best Western took forever. I had one satisfying moment. While we were waiting for the shuttle from the airport to the hotel, a woman (French, I believe) asked me for directions. Me? It turns out she was headed to the hotel right across the street from the Best Western, so I was able to help. Imagine that! This evening, we had dinner with the rest of the tour group. We are hitting bed early because the wake up call will be coming at 6 am. Then we are on the bus, headed for Normandy and the rest of our tour. After a fairly late start, we decided to put off touring the Cathedral of Notre Dame until tomorrow, and concentrated our touring day on the Louvre. It was a good choice. We started off with a quick breakfast at a sandwich shop around the corner from the hotel. 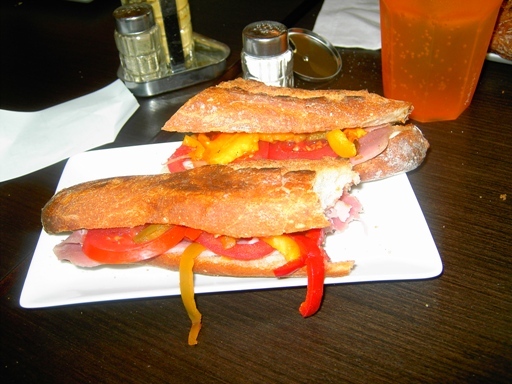 The hot ham and cheese on a baguette was very good. Our friend Cindy came into town from their hotel near the airport and met us in front of the museum. 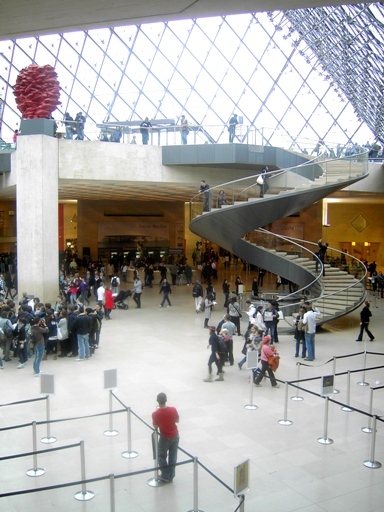 The Louvre is every bit as impressive as it is said to be. A view from an upstairs window, with the Eiffel Tower in the distance. I was a little concerned I would push Birdie and Ron a little too far, but that was not the case. We arrived at noon and didn’t walk out until 6:30 pm. They were as interested at the end as they were at the beginning. Cindy (on the left) assuming a classic pose. and then moved to the Italian Renaissance section. Before we were done, we managed to hit many, many of the highlights. Birdie -- posing for a Peter-Paul Rubens portrait. 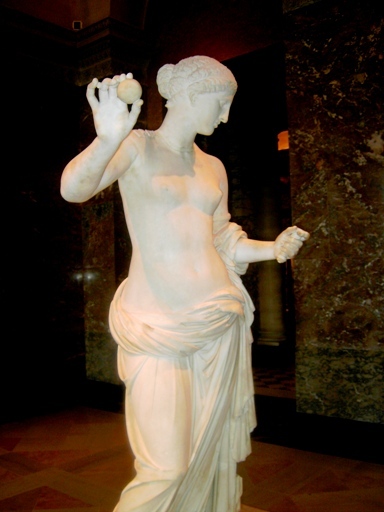 Sorry, Birdie, you may have a Rubenesque figure, but it's not going to work. Way back in high school, I took a two-semester course as a senior on Humanities. It covered art, music and architecture. The music part is still pretty-much lost on me, but some of the other material stuck. More than 40 years later, it paid off. Thanks, Mrs. Bailey! Birdie has been a never-ending source of material for these postings. 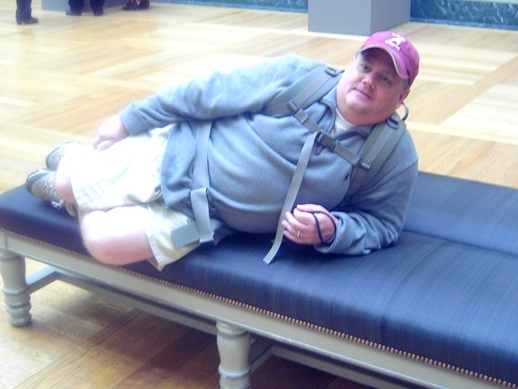 Today, as usual, he was wearing his University of Alabama ball cap. Some other guy, apparently an Auburn fan came up to him and got face to face. The exchange went like this. 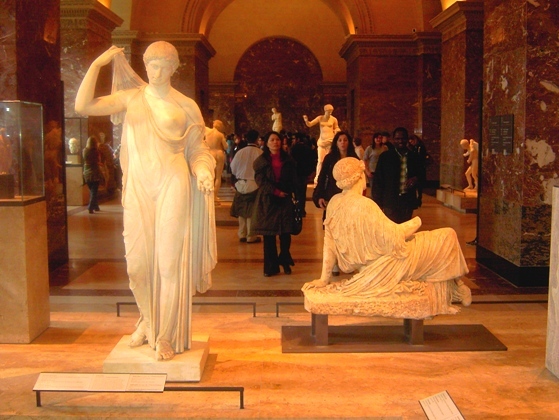 You go all the way to the Louvre in Paris, and you can’t escape! 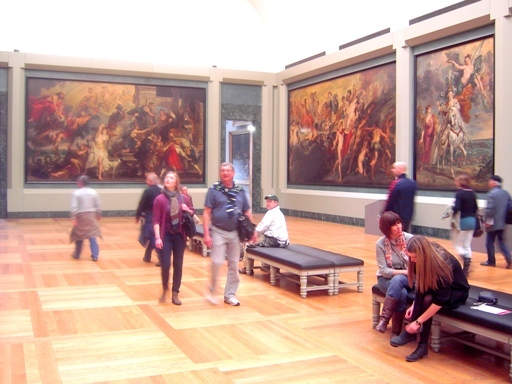 As we were wandering through the section with the Dutch and Flemish masters, Birdie asked me if we could find the original painting of the poker playing dogs. I told him I believe that was located — along with all the portraits of Elvis Presley painted on black velvet — in the “Red Neck Museum of Tacky Modern Art” in Talladega, Ala. 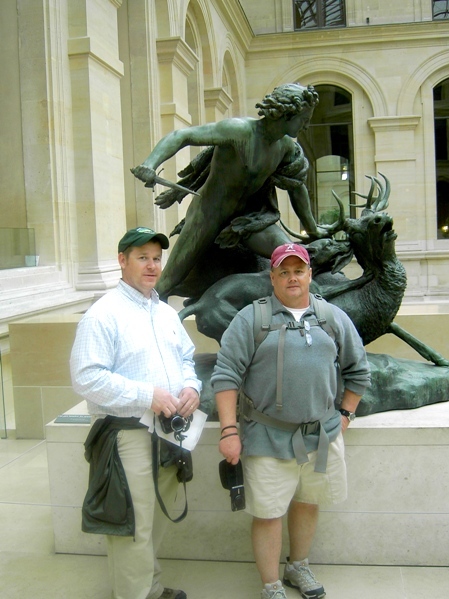 Both Ron and Birdie has special interest in any of the art that related to hunting or already-dead animals. This bronze of a hunter slaying a stag was their favorite. We took the crowded Metro back to our hotel. I let myself get distracted by a very cute little girl of about 9 months of age. She was very interested in making faces at the strange guy standing next to her mother. 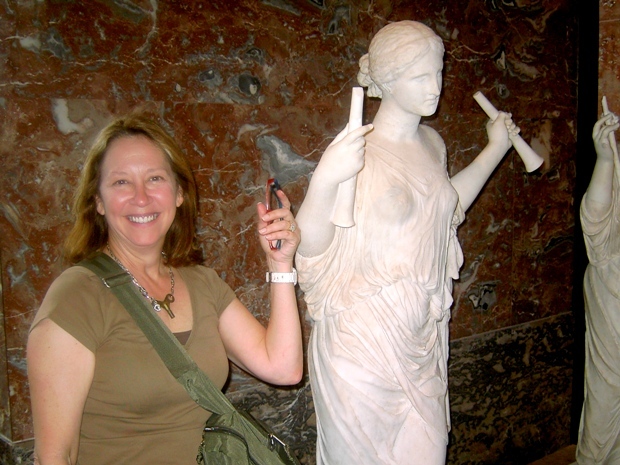 (Mrs. Poolman will tell you that is an occupational hazard of traveling with me.) We got off at the right stop, but in my distraction, I forgot that wasn’t our final destination. We were outside the ticket gates before we realized we had to get back on another train to reach our hotel. Of course, neither of the other guys picked up on it either, so I didn’t feel too bad. It amounted to just one wasted Metro ticket, so no serious harm done. 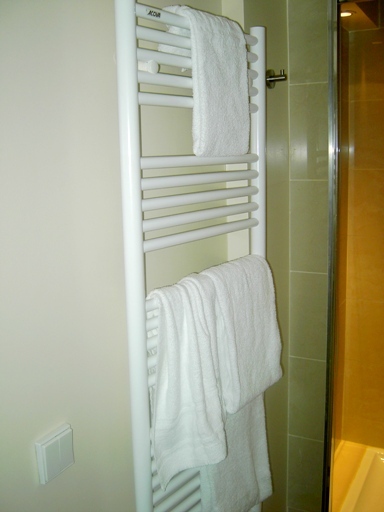 On the issue of hotels, ours is quite nice. It is a small city hotel. The rooms are not all that large, but they are very nice. The two young ladies who have run the front desk this week have been super helpful. (I do think they are amused by our efforts to communicate in French. They both speak English quite well. ) 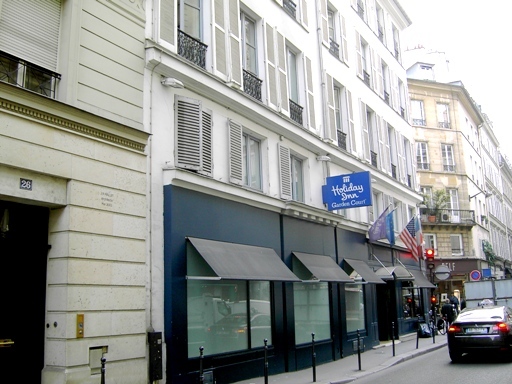 I’d come back to the Holiday Inn Paris Elysees in a heartbeat. We had a nice dinner at a café right down the street. Tomorrow, we will head out to the airport hotel early to drop off our bags for the next night and pick up my bother, Dan. 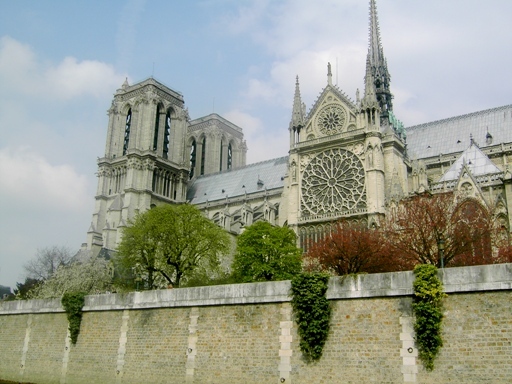 If the weather holds, we will tour Notre Dame and the Musee d’ Orsay (Impressionist art). It’s been two good days so far. We’re looking forward to hooking up with the tour group and the rest of the trip. Well, today has been quite an adventure. Our flight to Paris was smooth and uneventful. They showed that Denzel Washington movie about the runaway train, so that made a couple of hours fly by. We got into Charles DeGaulle Airport around 730 am just as it was starting to get light. On the other hand, the trip from the airport to the hotel, on one train and two metro subways was a real adventure. It involved large amounts of time wandering around looking for an appropriate exit (sortie), at least one nearly-lost train ticket, and an incident where an admission gate snapped shut, with me on one side, and my arm and bag on the other. 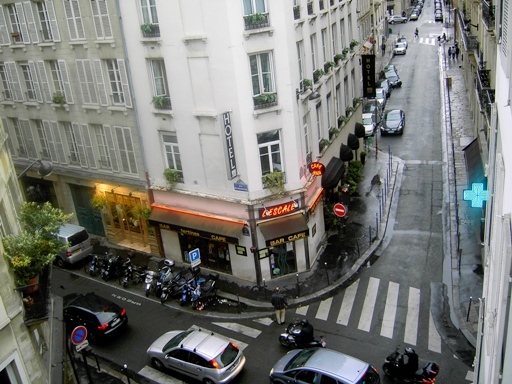 When we finally popped out of the last Metro station, our destination street, Rue d’ Miromesnil (after which the Metro stop is named), was no where in sight. Rather than wander around aimlessly, I walked into a bakery and got two very nice people to point me towards the right street, just a block away. When we got to our hotel, we felt like we had finally arrived. We had been rode hard and put up wet. Our rooms were not ready yet, because it was only 930 in the morning. We caught our breath. 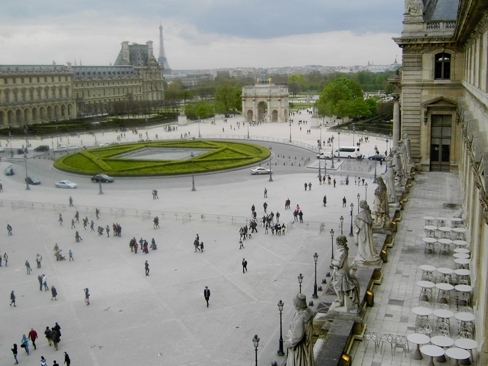 Then we left our bags with the front desk and backtracked our route back to the Louvre area. 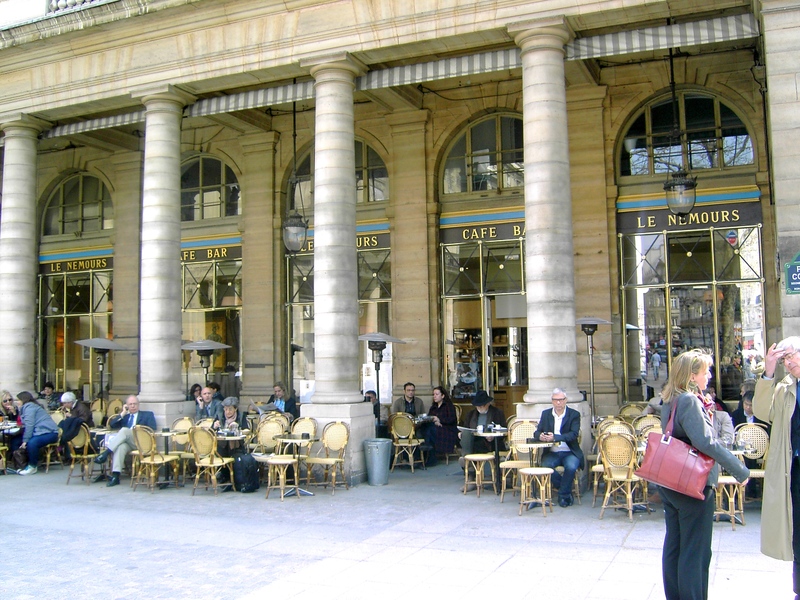 We had lunch at a nice café that travel-writer Rick Steves recommended. After lunch we walked through the Louvre grounds and down to the Seine River. 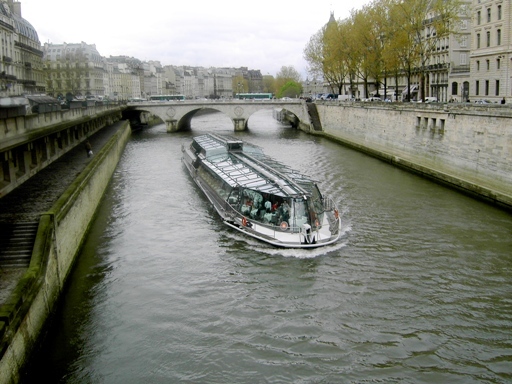 We bought tickets to the Batobus which is a boat that travels up and down the Seine, stopping at eight different locations. You have unlimited jump-on jump-off opportunities. 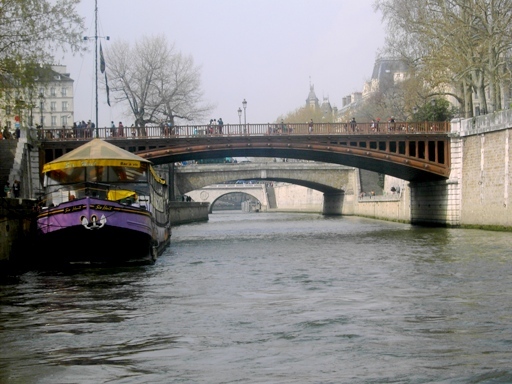 We spent around an hour and a half riding up and down the Seine, chilling out and taking pictures. After one complete round trip, we figured our rooms would be ready so we headed back to the hotel. Birdie, Ron and I met up later at a bar-café about a block from the hotel. They said it was the only one of several such establishments that made them feel welcome. 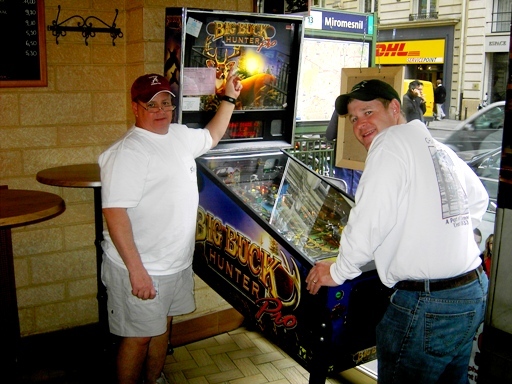 It might have had something to do with the pinball machine – Big Buck Hunter Pro. Birdie and Ron are both big outdoorsmen, so that made them feel right at home. Birdie commented that he expected to see that in a convenience store in Vidalia, Ga., not in downtown Paris, France. 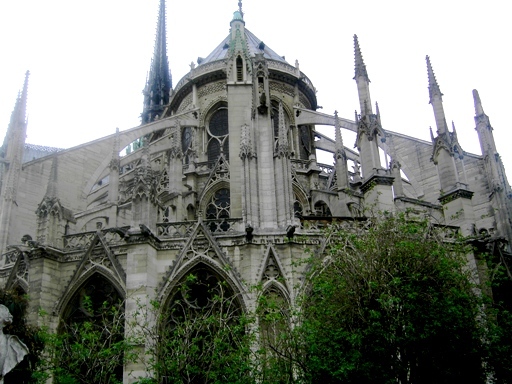 Tomorrow, the plan is do Notre Dame and the surrounding neighborhood, and then the Louvre in the afternoon. I hope the rain holds up. This blog is going to take a different slant over the next two weeks. I am joining my brother and two friends on a two-week tour of Europe. We are visiting Paris, Normandy, Netherlands, Belgium, Luxembourg and Bavaria. I am going to use this blog platform as a way of keeping our families up to speed on our “adventures.” Here is the story. Last Memorial Day weekend, my friend, Birdie, pulled me aside at a backyard pool party at our house and said that he and his wife were planning a trip to Europe in 2012. They were looking for another couple to go along. Like me, Birdie is a bit of a military history geek. The prime purpose would be to visit the D-Day beaches at Normandy, but with additional travels from there. Details to be worked out later. We agreed in principal that we would go along. So I got off the phone and talked with Mrs. Poolman. She said she had no interest in going on this military history tour, but I should call my brother back immediately and tell him to count me in. 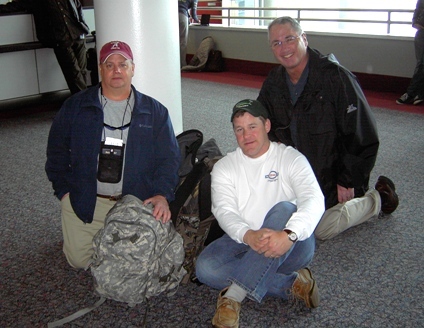 That put me in the awkward position of having to go back to Birdie and tell him that “I have a better offer.” To make long story short (or shorter, anyway) Birdie found himself a roommate, Ron, and the two of them joined up with the Band of Brothers tour. As I write this, I am sitting in the Charlotte (NC) Airport awaiting our flight to Charles DeGaulle Airport. Birdie, Ron and I will be spending two extra days on our own in Paris before meeting up with the rest of the tour group on Thursday. None of us are world-travelers, so this should be interesting. I already described my less-than-successful efforts to learn a little French. 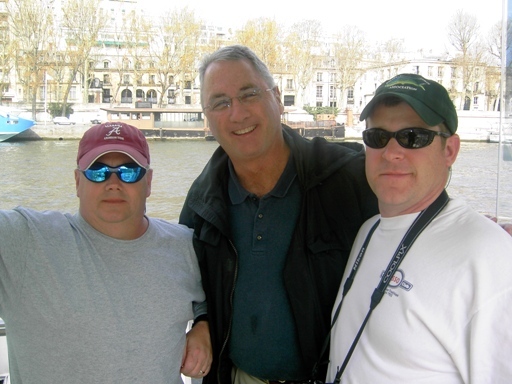 The only other time I went to Europe was on an Air National Guard junket back in my TV news days. So this should be interesting. I’ll be posting more updates and photos as time and WiFi access permit. I knew we were in trouble as soon as I opened the mail box. We had been caught. Oops! That does not look good. 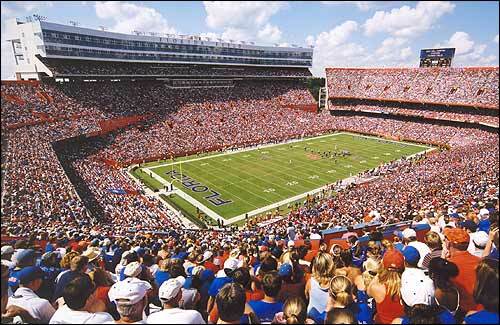 My father-in-law, who passed away in 2006, bought season tickets to University of Florida football games back in the late 1980s, when they were practically giving them away. Shortly thereafter Steve Spurrier arrived on the scene, followed later by Urban Meyer. The past two decades have included a handful of conference championships, three national championships and two Heisman Trophy winners. The demand for football tickets has risen dramatically. Like all major football programs, at UF you must make a donation to the athletic association at a certain level to have the privilege of purchasing season tickets. Today that required donation runs into the thousands of dollars. In the late 80s, it was about a tenth of that. So long as Father-in-Law was alive, he was grandfathered in at his original rate. The athletic association will allow a transfer to a son or daughter, but the expected donation would reset at today’s level. So when FIL died in 2006, we conveniently neglected forgot to tell the athletic association about it. To be blunt, we cannot afford the donation level they require for our seats. They aren’t great seats, and the donation level is near the bottom of the scale, but it’s still much more than Mrs. Poolman and I can afford or justify. I guess we will be spending more fall Saturdays in front of the TV, rather than enjoying the companionship of 92,000 of our closest friends. I hope they will miss us. We had a very good St Patrick’s Day celebration yesterday. I was so tired when we got back home in the late afternoon, I could barely move. It was a good day. As always, we started very early. Mrs. Poolman and I arrived at 5:30 am for the 6 o’clock opening of the squares. After a few minutes of negotiating with the people who had arrived earlier, we settled on our site and awaited the 6 am hour. Our site was good, but not great. We were on the perimeter of the square, but just a few yards off that one-half of the square where the parade actually passes. Our tailgate site, just before the sun came up. Our tailgating neighbors in the early morning. We had a diverse group, ranging from Mrs. Poolman’s co-workers, to my children’s friends and various other friends and neighbors. As always, “Mrs. 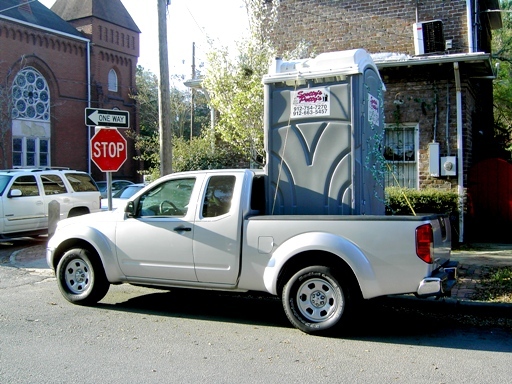 Poolman’s Personal Pick-Up Porta Potty” was a tremendous hit. In fact, it was a little too much of a hit. 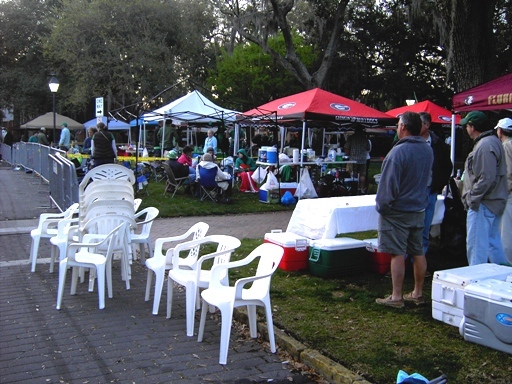 Some of our friends had a separate tailgate party set up for their family in the same square. They made a contribution towards the porta-potty fund for their group of — they said — around six people. Actually that group of six was closer to sixty. Oops! The result was sometimes the lines at our porta-potty were longer than those at the public stalls. Poolboy became annoyed when one of their guests challenged his right to use the potty. “Hey, this is MY mother’s potty!” (Aren’t those words t0 make a parent fell proud?) Next year, they say, they will get their own. That’s a good idea. It’s been a busy week, and it’s just getting busier. 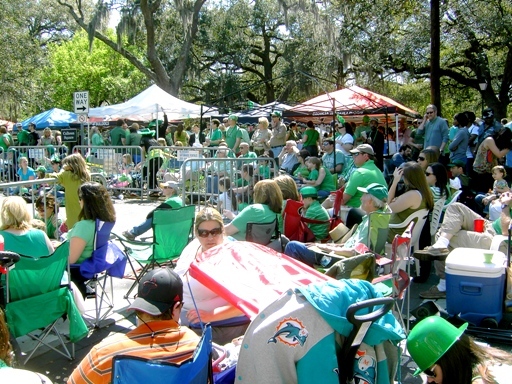 Tomorrow, St. Patrick’s Day, is a major holiday here in Savannah. It is also one of the Poolman’s big social events. 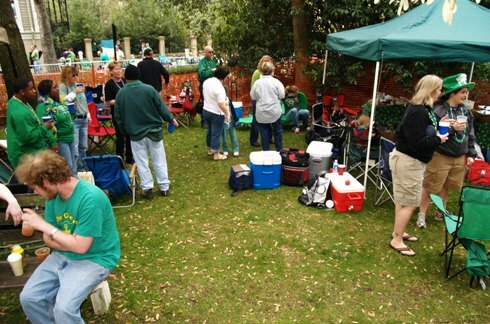 Since 2002, we have gone down to one of the downtown squares well before dawn and set up a tailgate party in one of the squares along the parade route. We plan to do the same tomorrow. The day will start around 3:45 am when the alarm goes off. We will need to be downtown by around 5:30 am. The police and park service keep everyone out of the squares until 6 am. Then they blow a whistle and the stampede to get to the choice spots starts. Initially, we were in Chippewa Square (where bus-bench scenes from the movie Forest Gump were filmed). 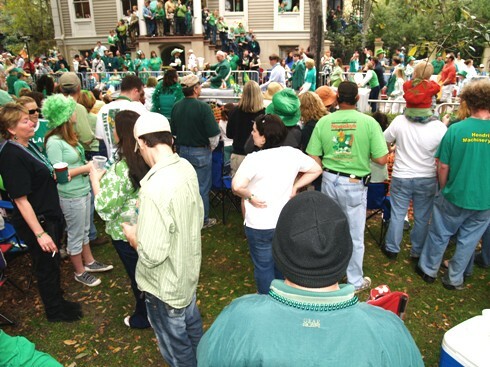 However, it just got to be too much of a madhouse, especially after the parade. We moved a few blocks away to a square very early on the parade route. There are still plenty of people, but it’s not crazy. Mrs. Poolman and I will set up our canopy, tables and chairs and await the sunrise and our guests. 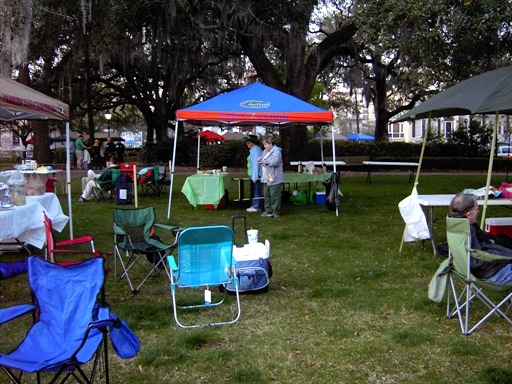 Our site in Chippewa Square before the parade 2008. A couple of years ago, Mrs. P became disgusted with the condition of the public porta-potties that are placed around the historic district. She came up with Mrs. Poolman’s Personal Pick-Up Porta-Potty. She rents a port-potty and has it placed in the back of a pick up truck. We park it on the street near our square and it remains a fairly clean source of relief for our family and friends. Mrs. P is famous and well appreciated in our limited circle for this concept. The parade will run from a little after 10 am until around 1:00 or 1:30 pm. 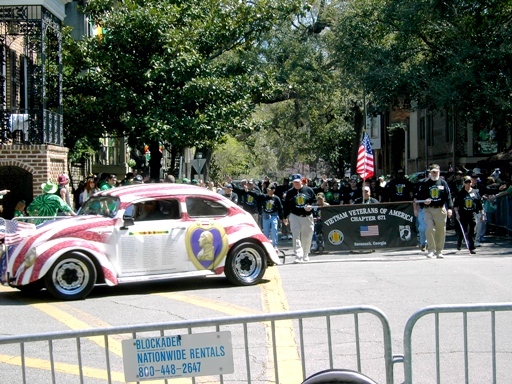 Watching the parade in 2008. We hang out and socialize for awhile, but we are usually home and recovering by around 3 or 3:30 pm. All told, it is a good day. We see a bunch of friends and neighbors who stop by for either a short visit or the entire day. Our two grown children are usually part of the crowd (if they are not working) with some of their friends. It should be fun. I’ll report on the outcome later.